Be sure to visit Monnit in Booth# 135 at Channel Partners Conference and Expo, March 16-18, 2016 at the Venetian & Sands Expo and Convention Center in Las Vegas, Nevada. Also be sure to catch the “6 IoT Applications You Can Sell Now” keynote at 11:30 AM Thursday, with Monnit CEO and Founder, Brad Walters. Executives will be on hand to answer questions and show you how easy it is to get started selling solutions in the Internet of Things, with complete wireless sensor solutions from Monnit. If you would like to schedule a meeting with us at the show click here. For more information on the show or to register, please visit http://www.channelpartnersconference.com. 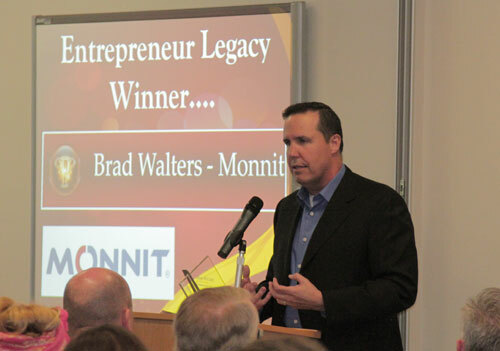 Brad Walters, received the Entrepreneur Legacy Award yesterday (February 18, 2016), in recognition for his many successes as an entrepreneur and for his involvement with educating and helping young entrepreneurs in Utah. Brad Walters is the founder and CEO of Monnit Corporation, the global leader in remote monitoring solutions for businesses. Since 1990, he has been a principal, investor and shareholder in over 15 technology startups. These include MaxStream, the leader in wireless utility meter reading solutions, where he served as CEO directing the company until its acquisition by Nasdaq listed, Digi International. Prior to that, Walters raised $70 million in seed capital in his co-founding of Lineo, the first developer of operating systems for smartphones. He started his career as a marketing representative for IBM in Salt Lake City. Walters is a former vice-chairman of the Utah Technology Council (UTC), longstanding board member of the Davis Applied Technology College and board member of various technology companies. Walters and his companies have won numerous industry and business awards including; Ernst & Young Entrepreneur of the Year for Technology, #92 ranking in Inc. 500 fastest growing company in the U.S., Stoel Rives Innovation Award, Provo/Orem Chamber of Commerce Business of the Year Award and most recently, named a Top 50 Internet of Things’ Company, in company with industry titans Microsoft, Amazon and Intel. 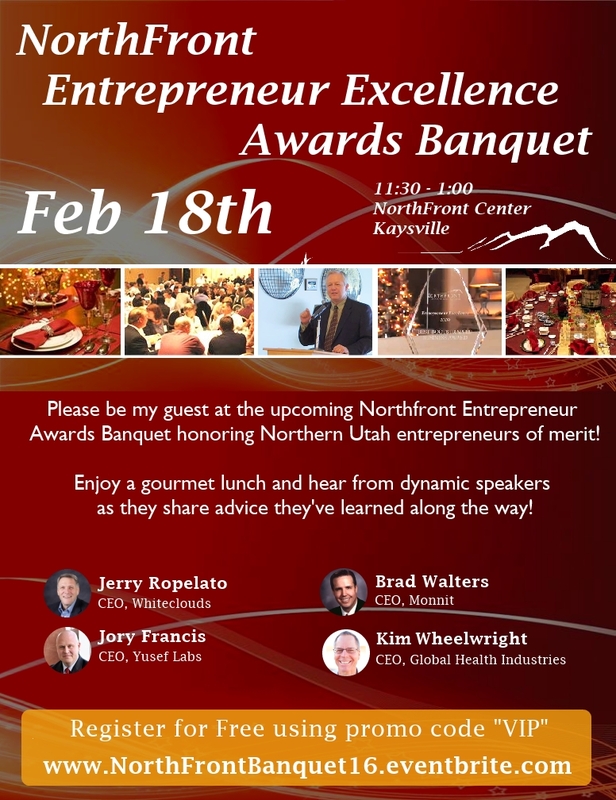 Please join us at the Upcoming NorthFront Entrepreneur Awards Banquet on February 18th, from 11:30 – 1:00 at the NorthFront Center in Kaysville Utah. Register for free using the promo code “VIP” at www.northfrontbanquet16.eventbrite.com. 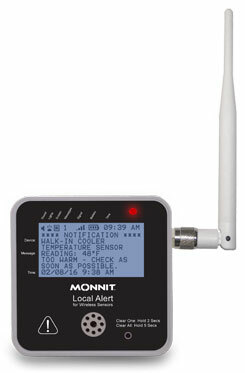 Salt Lake City, Utah – February 4, 2016 – Monnit Corporation (www.monnit.com) today, announced new wireless Local Alert devices which serve to dramatically change how critical sensor network notifications can be received. Inherent to the Monnit solution, is the ability for user’s to create custom notifications based on sensor data, and be alerted by text, email or phone call. The Local Alert provides an additional way to receive critical notifications and sensor readings through the iMonnit network. The Local Alert includes a flashing LED light, audible buzzer alarm, and a backlit LCD display screen to notify users when a sensor has detected a condition that needs attention. The Local Alert can also be used to display sensor readings from any sensor on the same account. Provides audible and visual alerts for wireless sensor notifications. Three alarm types: flashing red LED, audible buzzer, and backlit LCD message display. LCD displays device name, custom message or sensor reading, and time of notification/reading. Stores up to 10 notifications/readings. Configurable alarm and snooze intervals. Can be powered by included AC power supply or four 1.5V AA type batteries. Power saving features to extend battery life. Like all of Monnit’s wireless sensing products, the Local Alert includes free basic iMonnit online sensor monitoring, which provides an intuitive, easy-to-use dashboard, for configuring and managing wireless devices, and reviewing sensor data from any web enabled device, such as computers, tablets or smart phones. In addition to being able to send notifications to the Local Alert, the system can also send notifications via text, email or voice call if user defined conditions are met or exceeded. Monnit also provides products to OEM’s and Reseller’s through a business partner program (www.monnit.com/partner), which allows for volume discounts and private branding of both the wireless hardware and online monitoring software.